Last week's Test Kitchen ingredient was a white truffle salt that my older brother had mailed over to me to try out. I got several themes and suggestions from everyone who commented on the Facebook photo which really had me thinking. 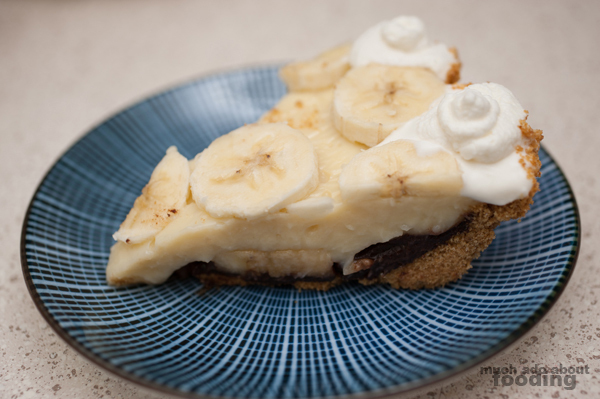 My friend Petey put out the idea of chocolate-covered bananas, and it really made me wonder: can I incorporate it into a banana cream pie somehow? 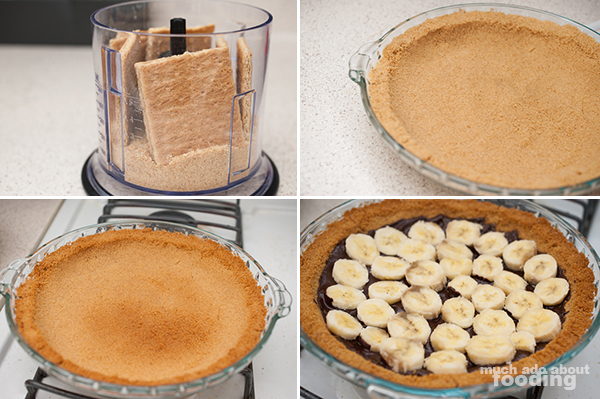 My mind was on pie because my friends and I were going to have a "Double Pi Day" dinner party for 6/28 - after some thinking, I decided that I would use the salt in a graham cracker pie crust and offset the savoriness with a layer of dark Belgian chocolate. Of course, you'll be able to substitute regular salt for the white truffle salt I used but if you happen to have a pinch or so on hand, try this version! Preheat oven to 350°F.You could cheat to make your pie crust or you can be awesome and make your own. I suggest going with the latter. Destroy graham crackers until you get finely ground graham dust in a food processor. Then add melted butter, salt, and sugar. Combine thoroughly before pressing tightly into a pie tin with the back of a spoon. 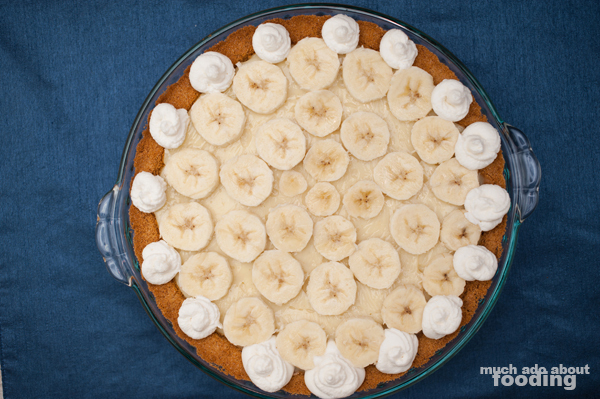 You'll want it to be packed tightly so it doesn't fall apart on you after you slice your pie. Bake for 12-14 minutes. Remove from heat and spread on dark chocolate. 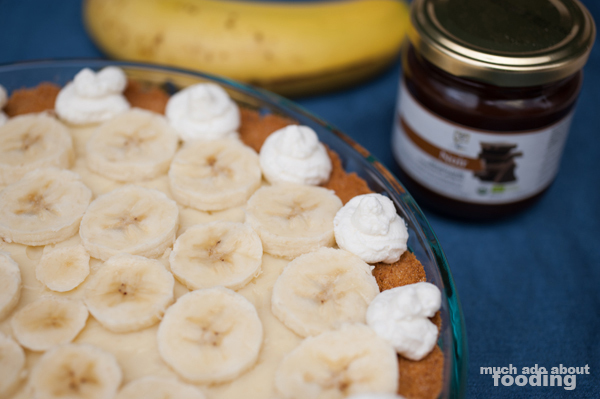 Slice one of your bananas and arrange at the bottom of the dish. I've never made pudding before but after trying it this time, it seems simple enough! In a saucepan on medium heat, mix together sugar, flour, and salt. In a separate bowl, beat together egg yolks. Gradually add in whole milk and stir continuously. Once it starts bubbling, cook for another 2ish minutes before taking it off the burner. 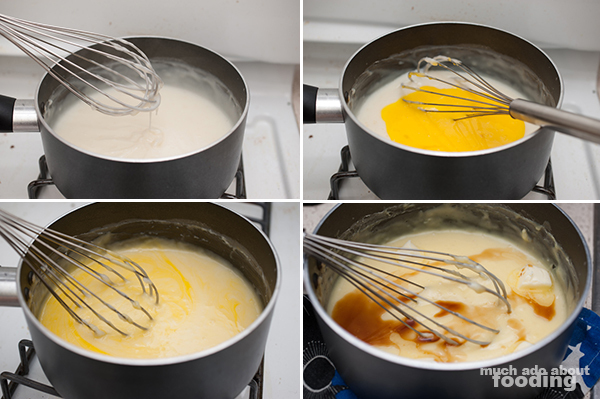 TEMPER your egg yolks by putting a little bit (about 1-2 tbsps) of the hot, thick milk mixture into the yolks and mixing it in; if you don't do this and pour the yolks directly into the pudding, you'll end up with icky scrambled eggs. Then add in yolks to full mixture and stir together. Cook for another two minutes before removing from heat again. Add in butter and vanilla extract; combine. 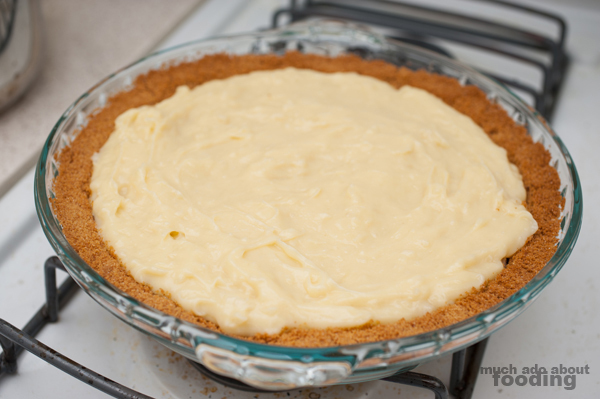 Pour pudding into pie crust! To prevent an icky layer from forming on top, cover pudding portion with plastic wrap and place into fridge. 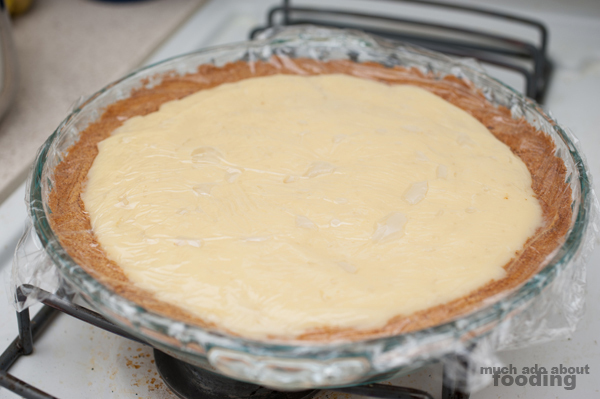 The pie will cool down pretty rapidly in the fridge but give it about an hour or two. In the meantime, you can make whipped cream! You could always buy your own but that's not hardly as fun. Combine all ingredients in a very cold bowl and whip with an electric hand mixer (unless you want your own hands to get super tired) until stiff peaks form. 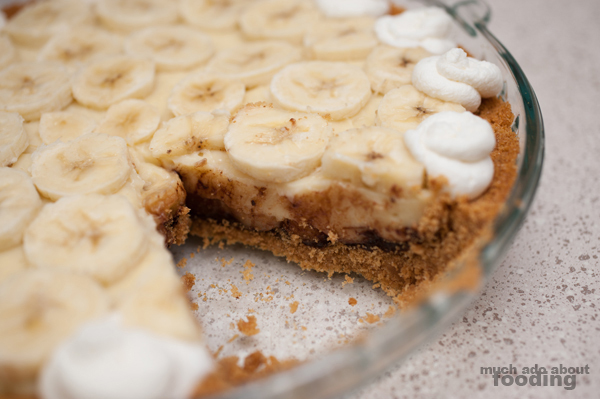 When the pie is ready to serve, slice remaining banana thinly and place on the surface. Pipe whipped cream along edges. Slice and enjoy! This particular item comes from the Marche Noir collection in Blackmarket Bakery, one that focuses on using wine flour. I've previously had their wine brownies before which are absolutely amazing. You need to try one when you get the chance! They also make pasta out of the wine flour, an ingredient that is created from pulverizing and dehydrating the skin of spent wine grapes. Isn't that neat? 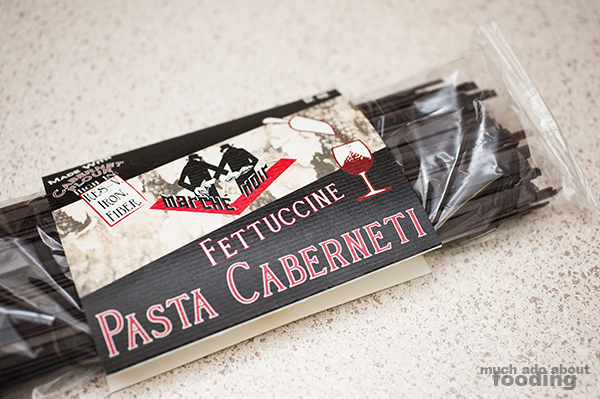 Anyhow, they still infuse the flour with a bit of red wine flavor and so, this wine will have little hints of Cabernet. What do you think it will taste good with? Comment on this photo when it goes up on Facebook! Photography by Duc Duong and Minerva Thai, whoever didn't have their face in pie. Oh. My. Holy. Delight. That looks SO good! !